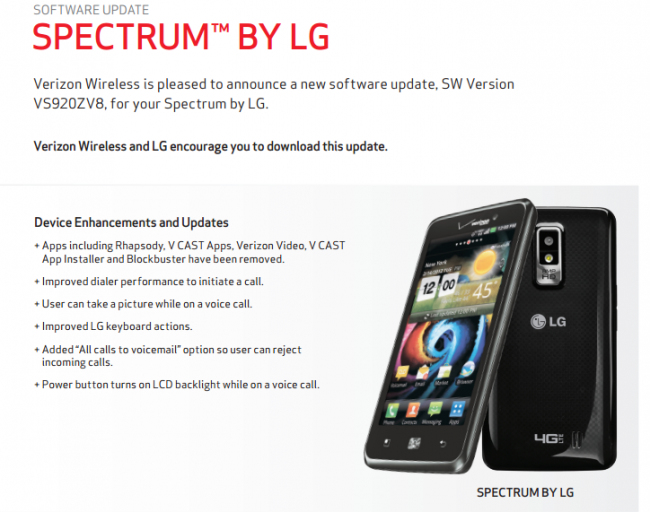 Moments ago, a somewhat minor update was approved for the LG Spectrum on Verizon to build VS920ZV8. This is the first official update since it received Ice Cream Sandwich last October. Verizon appears to be removing some of the bloat on the device like Rhapsody and V Cast Apps (which is dead), while also improving dialer performance and updating keyboard actions. Typically, when these documents go live, the update starts to roll out within a matter of days. Be sure to let us know when you receive it!